A while ago, I wrote a really popular piece of content around tracking goal completions through WordPress Contact Form 7 (WPCF7). A lot has changed over the last couple of years — but the popular WordPress plugin is still one of our favourites. 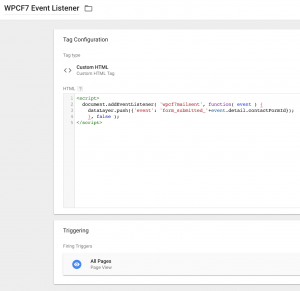 Tracking events from WP Contact Form 7 in Google Analytics? Well, firstly, the last few years has seen the rise in popular tag management containers such as Google Tag Manager abstract much of your on-site tracking code to the cloud for easier editing. This affects what many may know only as the “data layer”– and if you’re not in the know, I’d suggest reading this long form piece about Google Tag Manager by my colleague. Events can be “fired” in the DOM, and “handlers” can “listen” to these events. These listeners can then process additional scripts based on the outputs. And this is what’s happening here. If you’re unfamiliar with this terminology, then hang in as I’ve got a practical example for you below! Ensure you have Google Tag Manager installed. This may involve pestering your developers to add the tracking code to your website’s code. Or, it might involve simply adding a plugin (depending on your permissions). As of the time of writing this post, I recommend DuracellTomi’s Google Tag Manager for WordPress as it achieves a few extra cool features (authorship tracking, etc) too all bundled into the plugin code! Ensure you’ve got a GTM account set up, and get your Container ID added into the plugin. Also, for debugging, it’s nice to use a Chrome plugin called Tag Assistant by Google (but you can just type “dataLayer” into your browser’s console to view the stacked there, too). Download that for later. Track each form as an individual custom event in Tag Manager – this tracks individual form IDs! This code snippet essentially registers an event listener on “all pages” (it’s simpler that way – room for optimisation if you have time!) 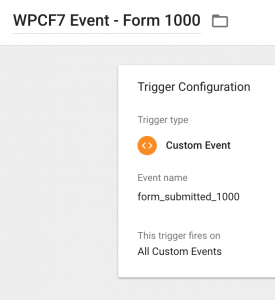 for the custom event “wpcf7mailsent” and triggers a dataLayer custom event. Using this second option gives more granularity in reporting and importantly through Google Tag Manager allows different tags to be fired on different form completions. 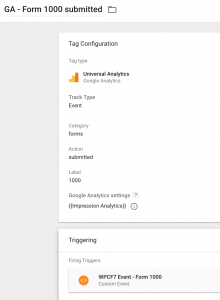 You should be able to see your events in Google Analytics real time. Don’t forget to put your Google Tag Manager container into “Preview” mode like the below, and ensure you “Refresh” if any changes have been made. From here, go ahead and set up custom Goals as you usually would. That’s it! You’ve now got a scalable WordPress Contact Form 7 & Google Tag Manager solution implemented! Don’t forget to publish your Tag Container and leave preview modes. If you’ve got any questions, please let me know in the comments below! Thank you for signing up. We hope you enjoy!